After my husband and his friend built our beautiful tractor-style coop and run, my hubby must have run out of steam because he just kept forgetting about building a feeder. I was getting tired of using my regular birdfeeder as a chicken feeder, so I finally took matters into my own hands. I wanted to have the feeder inside the coop and wanted to use the recessed space between the wall beams to limit the amount of space it would take away from the interior. (See the space to be filled in the picture on the right) I also wanted it to be removable for easy filling, to be able to see when it needed to be refilled like my regular bird feeders, and wanted it to hold as much feed as space allowed. The wall beams were about 14 1/2" apart and I wanted the top to be near the top of the wall with the bottom being at the right height for feeding. 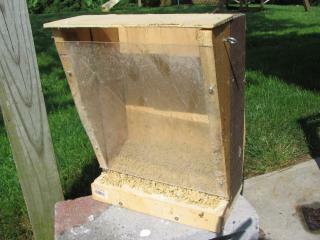 This ended up meaning that the feeder could be no taller or wider than 14". I looked around and saw some good ideas, but nothing quite was right so the following is what I came up with. The top and back are made from scrap pieces of ¼ " plywood. The top measures 11 ½ " x 4 ½". 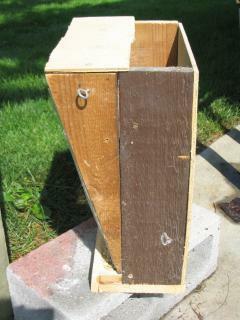 The back measures 11 ½" x 13 ¾"
The sides are made from scrap 1x4 wood. Each side consists of two pieces, one rectangular and one triangular. There is no reason you couldn't make it out of one piece, it's just that I had this scrap that I wanted to use. The two pieces of each side are held together by a corner brace (again something that was just lying around in the garage). Connect so that the corner brace will be on the interior of the feeder when finished, as in the photos. Rectangular sidepieces measure 12 ¾" x 4". Triangular sidepieces measure 12" x 4" and were then cut in half from corner to corner diagonally. Don't worry about the angle, it is irrelevant. See the photos if my written description isn't clear. The bottom consists of scrap wood also. It is a 5 ½ x 11 ½" piece of ¾" thick wood. 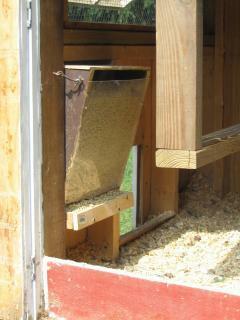 The rails on the feeder trough are made from scrap ½" thick trim wood. The front rail measures 1 ½ x 11 ½". 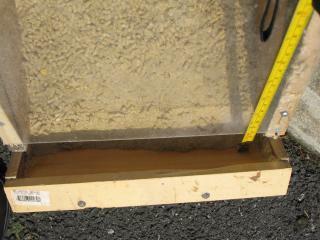 The two side rail pieces measure 1 ½ x ¾". I first assembled the each side by attaching the triangular piece to the rectangular piece using the corner braces. 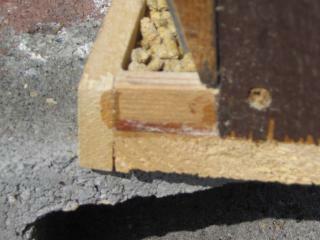 I use pellets so wasn't worried about small gaps, but you could also put wood glue in to seal the crack between the pieces. The back was then screwed onto the solid bottom piece and the side pieces screwed onto both the back and bottom so that the sloping triangular pieces are in the front with the widest section at the top. See the photo above left. The front rail was then screwed into place. I glued the two side rails in place since they were too small to bother screwing. Be generous with the glue. See photo on right. The front piece is made from 1/8" plexiglass and measures 11 ½ x 12". So far, everything I had used was stuff already lying around our garage. Unfortunately, I did not have any Plexiglas so I made a trip to Lowe's. Be sure to ask if they have any remnant pieces so you don't have to pay for a bigger sheet and get the thinnest remnant piece they have. I had them cut the size I wanted so I didn't have to fool with doing it myself. ( I think the price was around $8). You do not want to screw right into the Plexiglas - predrill the screw holes first to avoid splitting it. Position the Plexiglas piece so that it is a little above the rails. This will vary depending on what feed you use, but mine was placed about ½" above the rails or 1 ¾" above the bottom of the feeder as in the photo on right. Be careful putting the screws in - too tight will cause the Plexiglas to crack like mine did. Fortunately, it didn't crack the whole way through and I didn't have to buy a second piece. You could probably make this section out of plywood, too, but then you wouldn't be able to see when the feed is getting low. The last thing was to put the top on. Not sure if I really needed this or not, but just to keep the chickens from getting into the top of the feeder I used one screw to place the top on so that it would pivot for easy filling as seen in the photo on left. Filled the feeder and it was ready to use. I haven't actually weighed how much feed fits in, but believe it to be about 10-12 lbs. Anyway, it holds enough for our 4 hens for at least a week. I went with form over function. It may not be beautiful, but my hens don't seem to mind. Final installation in the photo on right. I almost forgot! The shelf bracket I used worked, but the feeder still wobbled and I was afraid that some overeager eater would tip it onto herself. 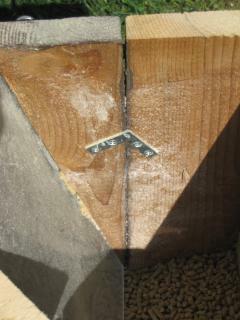 I used two hook & eye sets, one on each side, to secure the feeder to the wall. See the closeup below and the photo on the right near the top of the page. 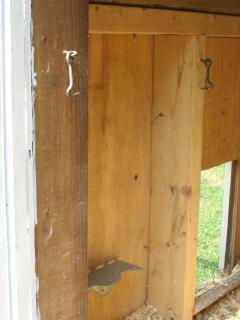 I hope this helps give others an idea of how to better use that wasted space in the wall of the coop! 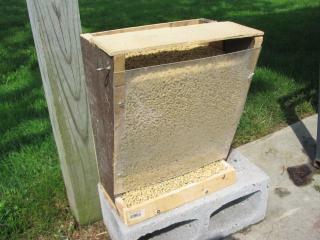 Good job on building your feeder! The article was easy to understand how you did it and the photos were a good addition. This feeder is really cool! This is an awesome feeder! I built it myself and my chickens love it! Thanks so much! Wow that is very neat lol I would just make the base a bit bigger in order to expose mre feed, and cause more chickens to eat at once. I like! 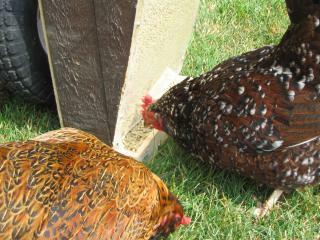 With the front angling out from the bottom, it keeps them from perching on the lip of the food tray area. I've been looking for a differnt type of feeder. my girls just waste so much food out of the store bought round feeder. this might work! working on a new movable pen for the meat birds I have coming, so that's the next project. That is awesome! I am glad I found this post - I am getting ducks this spring and was looking for something different for a feeder for them. 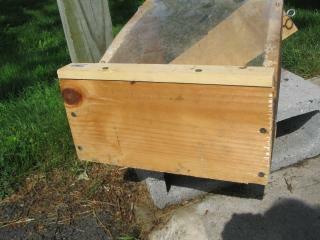 My hens have a bucket w/lid and holes at the bottom screwed onto a planter dish. 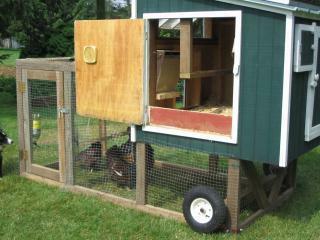 But I may try this idea as it keeps the floor area of the coop free! Thanks for posting! Caution with treat hanging strings. 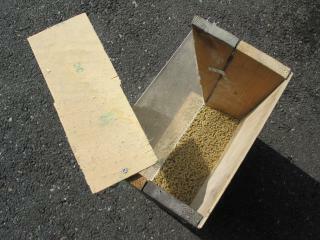 This article will explain how to make a simple feeder out of a barrel! Healthy Treats For Wild Ducks?